Hello all Windows Phone users. Actually its been few weeks since I bought my new Nokia Lumia 520. So after trying Apple iPhone, Google Nexus and Samsung smartphones I came to my old phone favorite 'Nokia'. After buying the phone I was setting it up to my personal taste and then I found out that in Windows Phone, we can't just set any mp3 file from Music player as a ringtone. To set a music file on ringtone we have to go through a very short and easy process which I am going to tell you right now. Although, this whole documentation is available on Windows Phone website and users also get an option in your ringtone settings to see how to add new ringtones. But as I found out that windows phone's website lists too many methods and things on a single page and for me, it was a little complex and hard to understand. Because on windows phone, it gives you various options to set custom ringtones such as downloading and setting ringtones by using Windows Phone Apps or by using Windows Phone Desktop app's sync feature. But to my personal taste, I don't like downloading separate files and apps just to add ringtones and its also a little time consuming and complex to move ringtones via Windows Phone Desktop app. Therefore, I instead prefer a very simple method. And that method is connect your phone and move the mp3 file that you would like to set as a ringtone to your phone. And that's it. That's how easy it is to set a custom ringtone on any Windows Phone such as Nokia, HTC and Samsung. Although, don't worry if it doesn't make any sense to you. 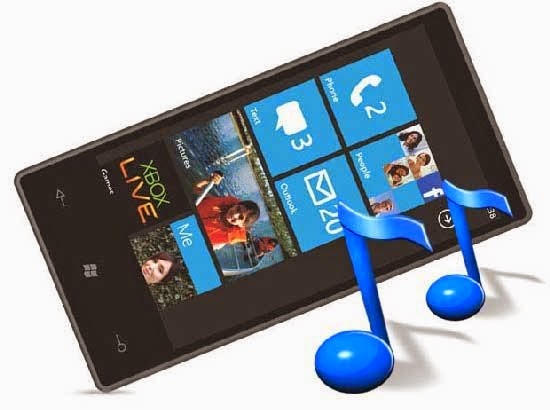 Following is the step by step how to tutorial on how to add custom ringtones to windows phones. Connect your phone to your computer via Data cable. Open My Computer and under portable devices, select 'Windows Phone'. Now in Windows Phone, you will see two folders, one would be Phone and one would be SD card or something like that. Double click on Phone. Now go to Ringtones folder. Now leave the ringtones folder as is and open a new explorer window or my computer and go to the folder where your mp3 or music file is located. Select and drag your desired mp3 file to the Ringtones folder window which we left before. Make sure that you can see your music file in the Ringtones folder now. Disconnect your phone and go to Settings - Ringtones + Sounds. In Ringtone menu, select the drop down menu and under custom label, you will be able to find your music file. Select that file and you're done. I hope it will make sense to you and you will be able to add and set custom mp3 files as ringtones on your windows phone. Although, I know that you can also move your music files from your SD card to ringtones folder by using Files app in Windows Phone, I have tried that and unfortunately that doesn't work out for me. Let me know if that works for you or if you need any further help with your Windows Smartphone.